David Reay and Associates (DRA) is one of 22 partners across Europe in an HORIZON 2020 (H2020) project in the area of Process Intensification (PI), funded by the European Commission to the tune of approximately €10 million. The project – called Intensified-by-Design® (IbD®) is led by IRIS. IRIS is an advanced engineering company that specializes in process monitoring and control solutions and novel technologies for process optimization (an area highly relevant to the IbD project), with headquarters in Barcelona and facilities in Dublin. DRA plays a fundamental role in several of the work packages, which include the supervision of the chemical process design methodology and management of the Process Intensification Implementation Team (PIIT), as well as coordinating the cohesion of all PI case studies. DRA is utilising tools – state-of-the-art review, 'expert system analysis', and numerical simulations, among others – to contribute towards the success of this project. The project commenced in September 2015 and runs for three years. IbD will create a holistic platform for facilitating process intensification in processes in which solids are an intrinsic part. (Of course this is one of the most challenging areas of PI as one normally associates intensification with much reduced plant sizes and unit operations having small channels etc.) The IbD approach is hinged on the use of robust data about a process to 'redesign', modify, adapt, and alter that process, possibly transforming it into a continuous, intensified system. Statistical, analytical, and risk management methodologies will be applied in the design, development, and processing of high quality safe and tailored chemicals, pharmaceuticals, minerals, ceramics, etc. based on intensified processes. As a major outcome, the IbD Project is directed at delivering EU process industries with an affordable and comprehensive devices-and-processes design platform to facilitate process intensification. While IbD is concerned primarily with processes handling solids, the approach, as far as PI analysis is concerned, will not be totally limited to solid materials processing. Five PI industry case studies will be implemented in mining, ceramics, pharmaceutical, non-ferrous metals, and chemical processes using the IbD approach and to validate the IbD methodologies, tools, PI modules, control and fouling remediation strategies, and the information and communications Platform itself for the industrial implementation of PI in processes involving solids. The Platform includes design modules for the commonest intensified reactors - Rotating fluidized beds, micro-structured reactor, and spinning disk reactor, among others, as well as a generic Module Builder - equipped with a set of both proprietary and third parties design tools - for designs carried out on the basis of radically novel ideas. The IbD Platform output is basically a dataset that comprises the intensified reactor design - ready to be built or assembled, an optimised whole process design including the upstream/downstream intensified unit operations and their solids handling capability, as well as cleaning methods, etc., and the expected economic and environmental quantitative impacts. The visualisation of this summary of work is found the Figure. It is expected that scientific papers, presentations at Conferences and talks at meetings of the Process Intensification Networks (in the UK – www.pinetwork.org and in The Netherlands - http://www.processinnovation.nl//homepinnl/index.htm ) will form some of the several dissemination activities around IbD. 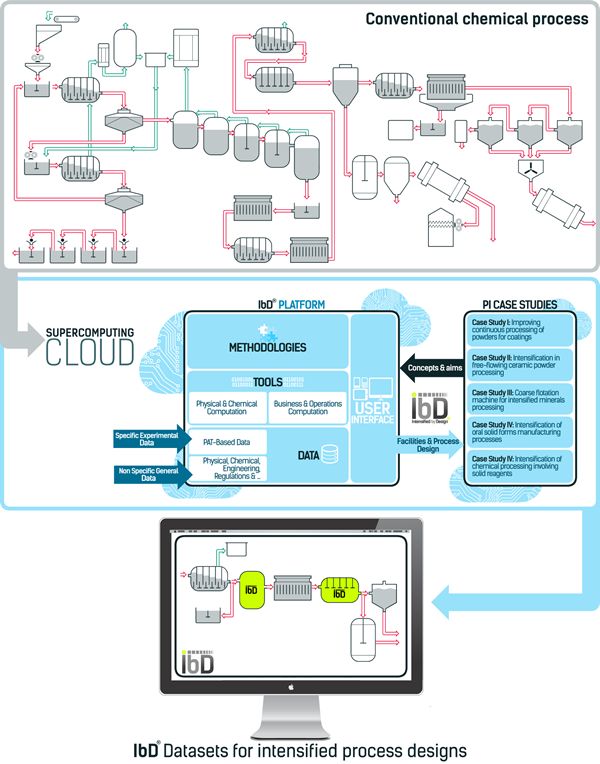 Figure: The IbD® platform is essentially a comprehensive devices-and-processes design-platform for the industrial realisation of PI involving solids handling – either from scratch or by transforming existing processes into intensified ones (Figure courtesy of IRIS, www.iris.cat). Historically, a considerable proportion of DRA's time was spent assisting ETSU at Harwell (now AEA Technology), for the UK Department of the Environment (now DETR). In particular, this has covered compact heat exchangers, heat transfer enhancement, process intensification, refrigeration, heat pumps and heat recovery. Work ranged from advising ETSU Project Officers on strategic aspects of R&D, helping companies prepare cases for support for energy-efficiency R,D& D projects submitted to ETSU, reporting on new technologies, preparing articles for publication which highlight areas supported by ETSU, and writing Good Practice Guides. One major project which was associated with ETSU was a study of catalytic combustion, with a view to assessing future R&D needs in specific application areas. This project was also funded by Rolls-Royce, ICI, British Gas, NEL and EA Technology. In 1996 DRA received an ETSU contract to assess the potential in the UK process industries for small-scale (<1MWe) combined heat and power (CHP) plant. Work for TUV-NEL included an assessment of compact heat exchanger designs for gas turbine recuperators and intercoolers. DRA was also contracted to examine intensified and/or energy-efficient processes for a major DTI study on new process technologies and technology transfer. For Serck Aviation, DRA studied enhancement techniques which might be applied to the compact shell and tube heat exchangers current used in most gas turbines as fuel heaters/oil coolers. DRA participated in an EU Framework (Then JOULE) project, as a subcontractor to Manchester University, to review process intensification technologies to be included in a process integration/expert system software package. This covered a number of unit operations, principally in the chemicals sector and in heat transfer. Much of the DRA current research is channelled through CEAM at Newcastle University - and the facilities for experiments on intensified processes will be employed where necessary to support the expanded group of Associates.